Apple has been expanding their magical electronic design since the last few years. Now they launched another awesome iPad which is mini in their version. There are two models have introduced the company which is W-Fi, Wi-Fi with Cellular connectivity options. Both smart tablets have slight changes. 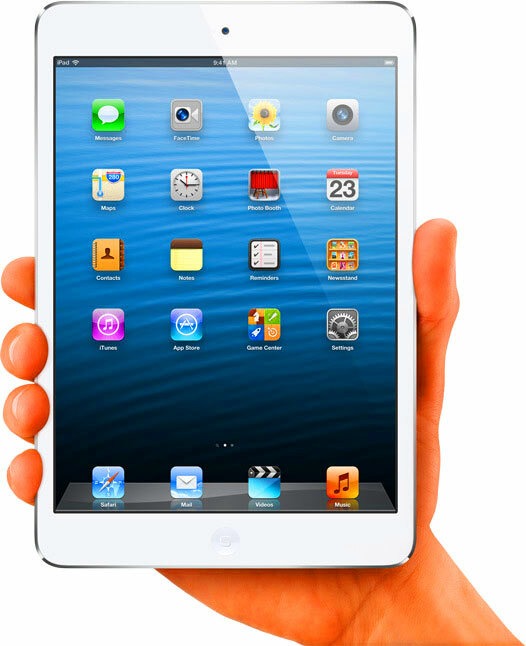 Apple iPad mini comes with 7.9 inches LED back lite IPS Retina display with 1024 x 768 pixels resolution. The stylish display has sports 264 pixels per inch (ppi) density and over 3 million pixels. The mini tab display featuring a Fingerprint resistant oleo phobic coating. iPad mini is 23 percent thinner and 53 percent lighter than an iPad full version. The mini version can easily fit a single hand and more vibrant to manage. Apple climes that iPad mini provides 35 percent larger screen area than a 7 inch normal tablet. iPad mini is powered by Dual-core A5 chip with 1GHz dual core ARM Cortex-A9 processor. The device has enables a sufficient graphic acceleration with the inbuilt support of PowerVR SGX543MP2 graphic interface. Apple iPad mini also sports decent memory options like 512MB RAM and 16/32/64 GB internal memory choices. Apple’s new Lightning port is also added to the device (it is introduced in iPhone 5). The device has 5 mega pixels iSight Camera on the rear with auto focus and Five-element lens. There is front camera for video calling which is a 1.2mega pixel. Full HD (1080p) video recording with Video stabilization and Face detection is also available. Apple iPad mini has an inbuilt 16.3 watt rechargeable lithium polymer battery which provides 10 hours of internet using on Wi-Fi, watching video or listening to your favorite music. The tablet also enables Three axis gyro, Accelerometer and Ambient light sensors. Apple iPad mini is available in black and white colors. The device has officially launched in India for Rs.21,900 (16GB variant-MRP). In US, the price of iPad mini is starts from 329USD. the popular online retailers priced the device through their websites. All retailers announced an offer price. Amazon offers the least price.